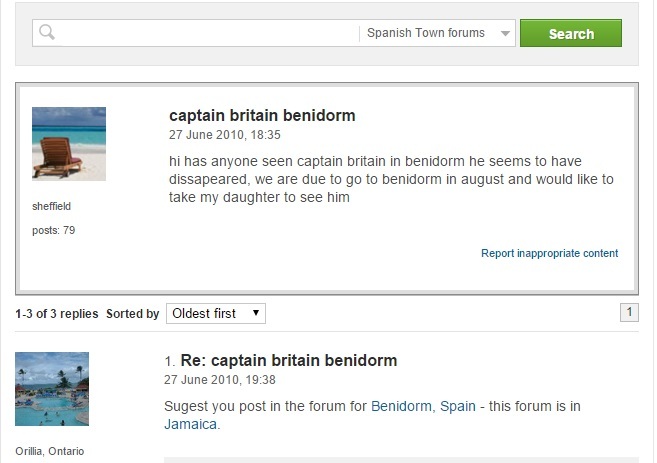 Captain Britain spotted in Benidorm | The Captain Britain fans' page and blog. With Captain Britain news light and my summer holiday imminent the blog will be shutting down for two weeks starting from today. I hope you all have a good summer break and I’ll see you in a fortnight. Until then please enjoy this Captain Britain entry I found on Trip Advisor. This entry was posted in News and tagged Benidorm, Captain Britain, Holiday, Trip Advisor by Richard. Bookmark the permalink.